Not a good day for Donald Trump or Rex Tillerson, his choice for Secretary of State. The entire senior staff of the State Department just resigned. Will there be a similar exodus at DOJ when Jeff Sessions takes over? Update: The Washington Post has two reporters working on the story. The first reported as above. The second, a few hours later, writes that Team Trump requested the resignations of several "senior State Department diplomats." Donald Trump's plans are already generating fear and loathing, resulting in violence. In Pittsburgh, PA, a Mexican college student who is legally in the U.S. listened to Trump on TV (while drinking beer) and got in an argument with his roommate, biting off his ear and breaking his finger. It seems the assaultive roommate feared being deported. Luckily, the assaulted roommate made his way to a gas station to call police. His ear was recovered in the room and stitched back on. The assaulting roommate is gone. Both come form Mexico. To paraphrase Trump's probable response: "What did you expect? People are angy." President Obama gives his final press conference. Most of the West Wing staff is will move out tomorrow. Obama's approval ratings are now very high. The UnPresident Elect's are the lowest of an incoming President in 4 decades. The Obamas will attend the swearing in ceremony and leave on vacation before settling into a new home in D.C. Check out the stunning photos of the home, which has more than 8,000 square feet (9 bedrooms.) The house belongs to former Clinton press spokesman Joe Lockhart who is now living in New York. President Obama is in Vietnam. He visited Ho Chi Minh's house. And he ended the arms embargo so weapons can now be sold to Vietnam. What a pleasure to read Vietnam newspapers -- the ones I've seen don't have autoplay video. Here are some photos of the welcoming ceremony. I'm sorry I haven't visited Vietnam. Here are ten reasons you really should go. Malia Obama will be going to Harvard in 2017. She graduates this June and will be taking a year off before college, which Harvard encourages students to do. I wish that policy existed when I was graduating from high school. Or from college. I don't think it would have made much of a difference in the long run if I became a lawyer at 25 instead of 24. And having a year off to travel or volunteer would have been fun. President Obama and his family have landed in Cuba for a very historic visit. 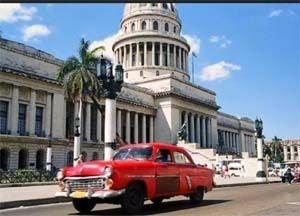 Who would not want to go to Cuba? I sure would. President Obama outlined his 10 point execution action plan for gun control today. Anyone who makes a living from selling guns online or at gun shows, two locations where sellers are often considered collectors or hobbyists and freed from the requirement that they conduct background checks, will be required to be federally licensed. As of now, he has 275,000 followers and is following 65 agencies and people.